Medi-First Flexible Knuckle Bandage - 40 Count. Perfect for those hard to cover cuts and sores. These bandages are designed to fit on fingers and knuckles where regular bandages will not go. Each bandage is made of extra heavy weight material and is latex free. 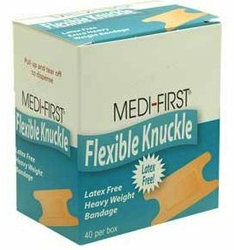 Medi-First Flexible Knuckle Bandage - 40 Count. Designed to fit perfectly on knuckles and fingers. Made of flexible, heavy weight material that is latex free.